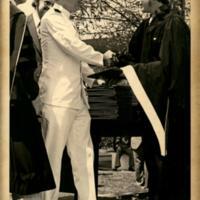 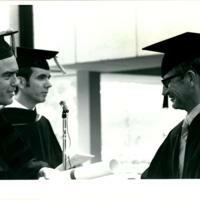 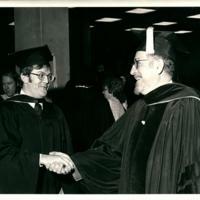 Graduate William Denton receives his diploma from his father and commencement speaker, Rear Admiral Jeremiah Denton, at the 1976 Virginia Wesleyan College commencement ceremony. 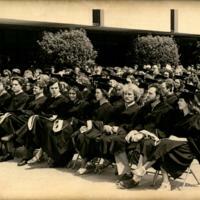 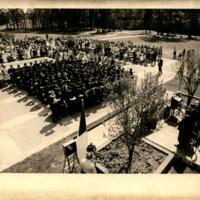 The 1976 graduating class sitting in the Hofheimer Library plaza at the 1976 Virginia Wesleyan College commencement ceremony. 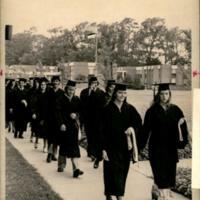 Graduating students holding their hoods as they walk in procession to the Hofheimer Library plaza at the 1974 Virginia Wesleyan College commencement ceremony. 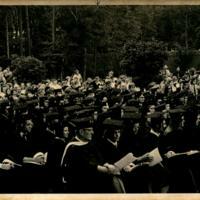 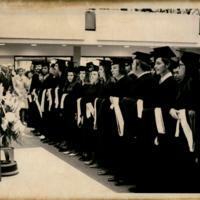 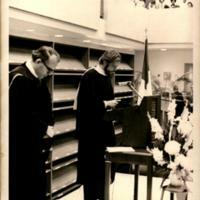 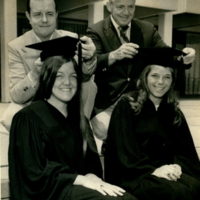 Graduating students hold their academic hood at the 1973 Virginia Wesleyan College commencement ceremony in Hofheimer Library. 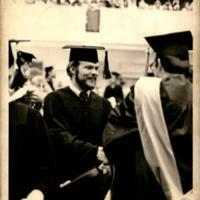 A graduating student with his diploma in hand at Hofheimer Library, where the 1973 Virginia Wesleyan College commencement ceremony was held. 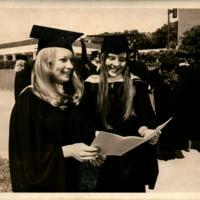 Graduating students, Kathy Olsen (left) and Judy Hall, (right) at the 1972 Virginia Wesleyan College commencement ceremony. 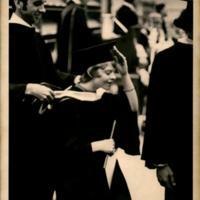 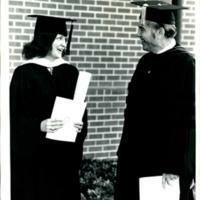 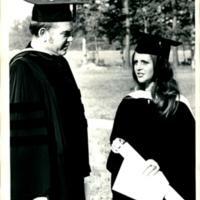 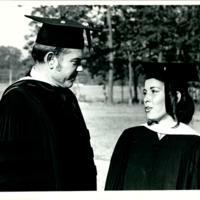 Rising senior Susan M. Ralph admires her fiancée and graduating student, Thomas Robert Brett, at the 1971 Virginia Wesleyan College commencement ceremony. 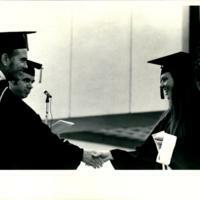 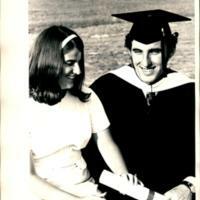 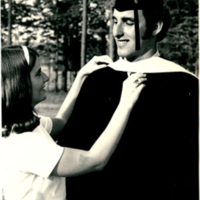 Graduate Thomas Robert Brett with fiancée and rising senior Susan M. Ralph at the 1971 Virginia Wesleyan College commencement ceremony. 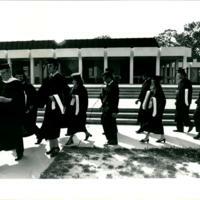 Colonial Robert Tucker leads the procession as College Marshal past Village 1 at the 1971 Virginia Wesleyan College commencement ceremony.